An osprey chick with its new US Fish and Wildlife Service band. Photo by Samantha Gustin, age 11. Adult osprey circling warily. Photo by Andy Todzia. placed metal US Fish and Wildlife Service bands on the legs of three quietly huddling chicks. Holding one youngster in a secure grip, Norm carefully negotiated back down the ladder with razor sharp talons and beak just inches from his face. 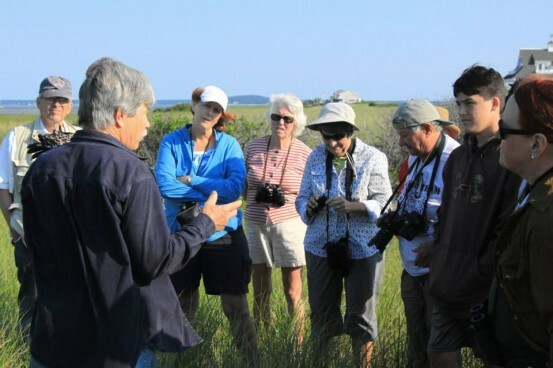 An intrigued group of onlookers hear answers to their questions about osprey from Mass Audubon’s Norm Smith. Photo by Gene Harriman. A waiting crowd of raptor enthusiasts and volunteer Beach Ambassadors gathered around Norm as he regaled them with stories about osprey life and his lifetime of work with raptors. Ospreys are a conservation success story, demonstrating how people can pinpoint the cause of a species’ decline and work to remedy it. 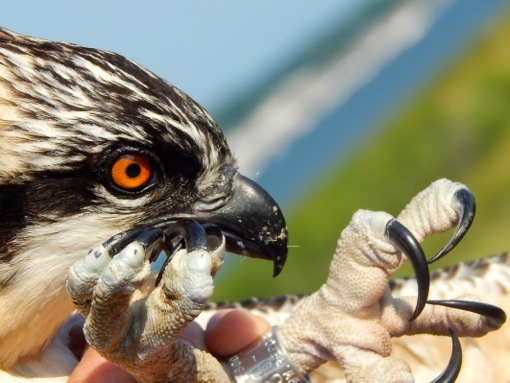 It was the use of DDT to control insect pests that brought the osprey to the verge of extinction in the 1970s. DDT biomagnifies in the environment causing greater concentration as it moves up the food chain. 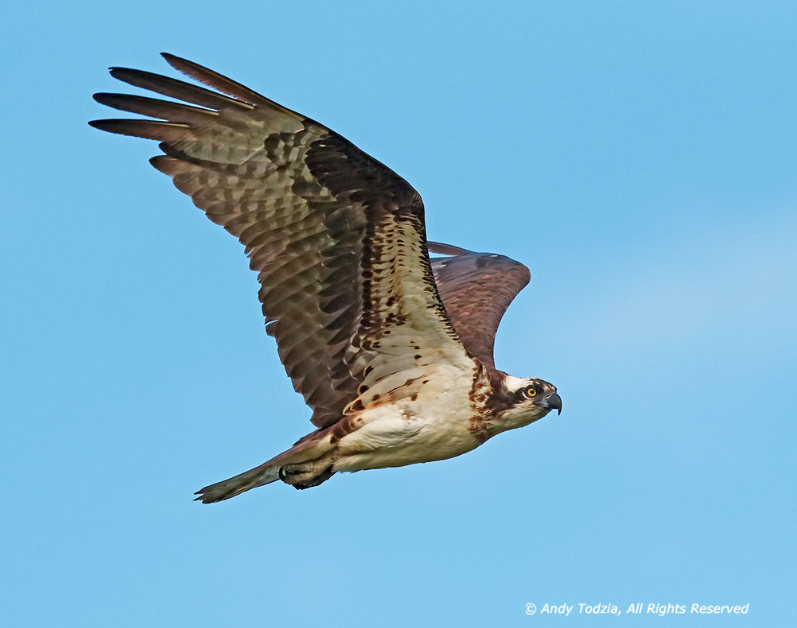 Osprey are fish-eaters; in fact, 99% of their diet is live fish, which makes them top predators. The biomagnified DDT thinned their eggshells causing eggs to break when the mother tried to incubate them. 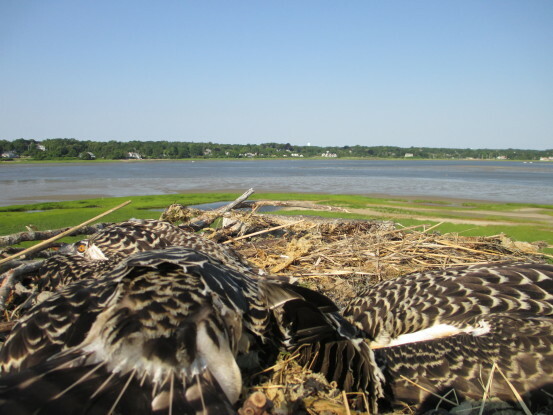 This caused a terrible reduction in the osprey population over the years; between New York and Boston, the number decreased to a mere 10% of its original size. Osprey family relaxes together in their nest. Photo by Andy Todzia. Beach, to attract the recovering population. Now, in most places osprey are doing well and people have the fun of watching them tend their families all summer long. 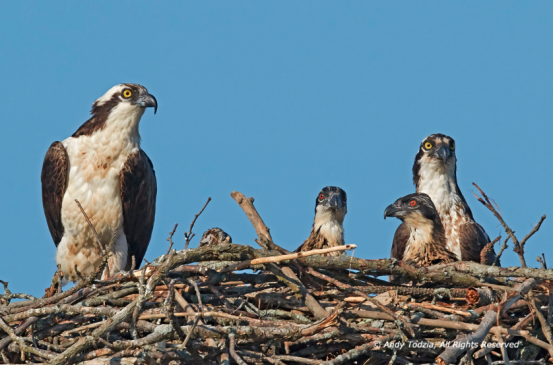 Before carrying the chick back up the ladder and into the nest, Norm emphasized to the group that the health of ospreys and the health of humans and our shared environment is inextricably linked. As top predators reliant on clean water that supports abundant fish, ospreys tell us when something is out of balance or poisonous in the long run, such as DDT. We should take a closer look when osprey numbers fall and celebrate when they thrive. 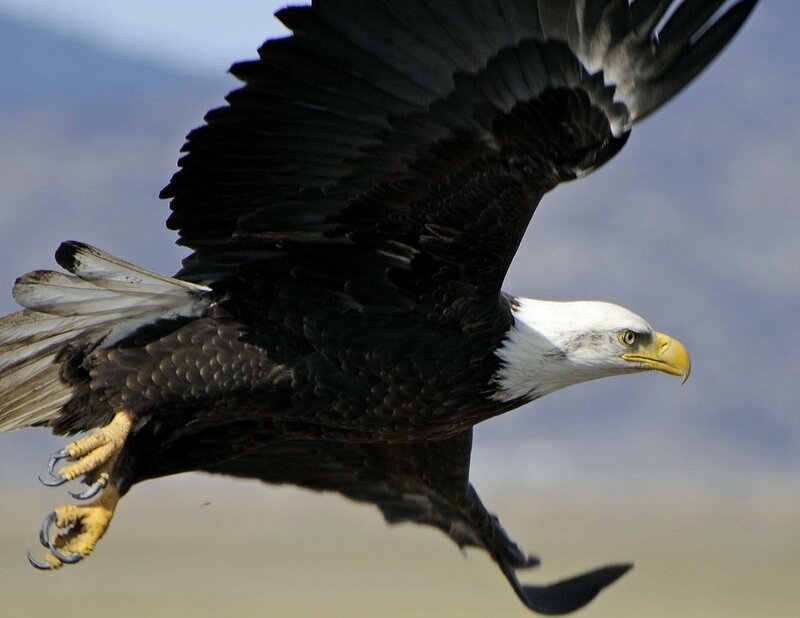 With that thought, Norm climbed nimbly up to the nest to replace the chick where it will fill its belly with fish from its parents along with its siblings watched over by the Beach Ambassadors and other visitors. A chick’s eye view of Plymouth harbor. Photo by Cole Gustin.